Welcome your guests with some staple favorites! 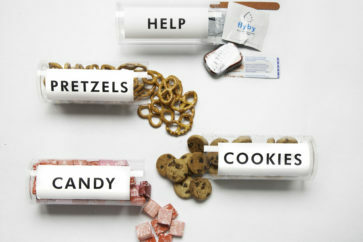 These are packaged in large tubes with Pretzels, Candy, Cookies and a Helpful Kit with items suchs as Advil, Altoids, Band-Aids, Fly BY Hangover Helper, Wine Wipes, and a Nail File. This package also includes the Fun Labels . All wrapped in a gift box with ribbon and Label.